Happy St. Patrick’s Day! It really snuck up on me this year! 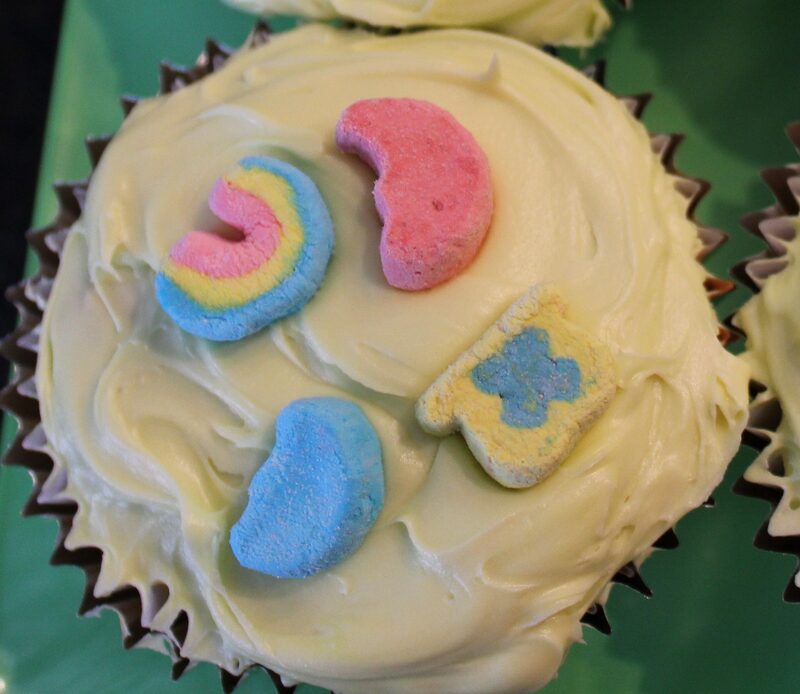 So yesterday I decided to make some St. Patrick’s Day cupcakes using Lucky Charms. Want to see how cute they turned out? I found the inspiration for my cupcakes on Pinterest. (of course!) There are numerous ways to make St. Patrick’s Day themed cupcakes but I thought the one using Lucky Charms cereal was so cute and simple. I had a white cake mix on hand but needed to buy some frosting and the cereal. Honestly, I can’t remember the last time I bought cereal with marshmallows! I also decided not to make my own frosting and buy ready made buttercream frosting. I added a few drops of green food coloring right to the frosting container and stirred it until the green was the desired color. Then I iced each of the cooled cupcakes and added a few of the marshmallows on top for decorations. They are adorable! I took some to my fairy god-children and gave them the rest of the cereal as well. I knew for a fact we wouldn’t eat it. Were the cupcakes “magically delicious”? The children told me they loved the cupcakes! But my husband ate one and was NOT impressed. He didn’t like the texture of the cereal in the cupcake. I think if I were to make them again, I would not put the cereal in the batter and just use some marshmallows as a garnish along with the green icing. They are really cute though! Another cute idea on Pinterest was to use colored sprinkles in the batter instead of the cereal. This would add some fun pops of color and maybe not be as sweet and sugary? But hey, it’s St. Patty’s Day! It’s okay to splurge!